« Pack Your Bags, Support Jobs! Ashley Zuelke and Julia McNerney represent the International Trade Administration on the U.S. Government’s Trade Promotion Coordinating Committee. 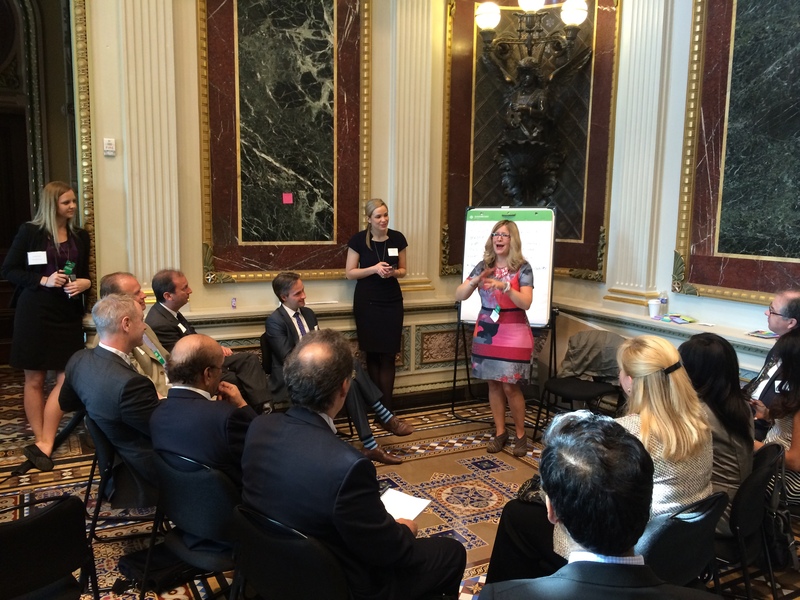 The Design Workshop at the White House featured group activities identifying best practices for entrepreneurs looking to compete overseas. The words “start-up” and “global” don’t often appear in the same sentence. But they should. Start-up firms and entrepreneurs represent the cutting edge of commercial product and service innovation. More importantly, they are critical job creators in the American economy. That’s why the Commerce Department, in partnership with the White House, has taken concrete action to improve the environment for high-growth entrepreneurship across the country, including increasing access to capital and reducing barriers to growth. Last week, at a Design Workshop at the White House, we took the next step in the Administration’s support of start-ups and entrepreneurs by beginning a conversation about how to better engage the start-up community on going global. By bringing together start-ups, accelerators, incubators, venture capital firms, service providers, universities, and government officials, we plan to develop a platform for a Startup→Global initiative that will be constructed and implemented together with those key stakeholders. These partners will help to kick-start a national conversation to further build out this concept and design a concrete, actionable, and measureable initiative to ensure that businesses in this ecosystem are poised to capitalize on the 1 billion new customers that will be entering the global middle class in the next 15 years. We recognize that certain start-ups, depending on where the company is in its lifecycle and its industry subsector, are often poised to rapidly expand to global markets right away. Our hope is to design an initiative to help make that not only possible, but most importantly, successful for more start-ups. We believe this will lead to more start-ups like Fenugreen, a social enterprise that takes on global waste with a simple FreshPaper innovation. Its product is now being used by farmers and families in more than 40 countries, and it’s simultaneously establishing initiatives to benefit local food banks in the U.S. and small-scale farmers in the developing world. These types of products and innovations, from agribusiness to health information technology to renewable energy, have the ability to transform the way that countries are developing while also advancing core U.S. values of trade, democracy, and security. A centerpiece of the President’s National Export Initiative has always been an effort to make exports an essential part of doing business, and have more companies selling more goods and services abroad. By helping more high-growth start-ups go global, we will further encourage trade as broader part of the American business DNA. Ultimately, this will lead to the United States being better positioned for future economic growth and competitiveness, and to becoming a more globally fluent nation.